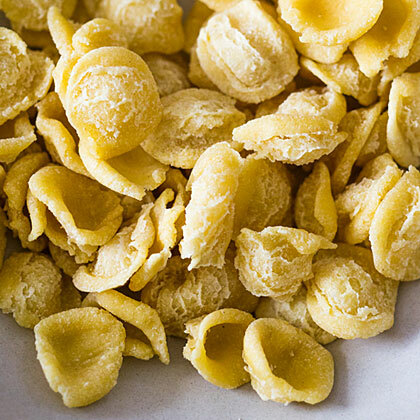 Orecchiette, or "little ears," for their cupped shape, are one of the simplest pastas to make at home. Admittedly, they're time-consuming, but, says Berkeley chef and cooking teacher Samin Nosrat, "Making them is an opportunity to connect to a culture and a place in time. It's a learning experience. Even if they didn't have that incredible texture, they'd still be worth it." Pour flour into bowl of a stand mixer fitted with the paddle attachment (not the dough hook) and turn it on at lowest speed. Drizzle in 1/2 cup warm water and let it mix until evenly dispersed and dough is sandy-looking, about 2 minutes. "You want the flour to absorb the water for as long as possible before adding the oil, since fat inhibits gluten development," says Nosrat--and gluten is what gives pasta its toothsome springiness. Drizzle in another 1/2 cup warm water (reheat if necessary) and mix 5 to 6 minutes, then another 1/4 cup and mix 5 minutes more. Let each addition of water absorb fully--at least 15 minutes for a batch this size. Drizzle in oil and mix 3 to 5 minutes, until dough starts coming together in little balls, climbing sides of bowl, and is moist and firm like Play-Doh. If it isn't, mix in more water, 1 tbsp. at a time. Press dough into a 1-in.-thick disk, wrap with plastic wrap, and let rest at room temperature 30 minutes. Set dough on a wooden cutting board and cut into snaky strips about as fat as your fingers. Keeping rest of dough covered with a damp kitchen towel, roll each strip into a cylinder and slice it into roughly 3/4-in. pieces. Form orecchiette: Set a piece of dough in front of you, turned so it looks like a diamond. Press tip of a table knife against the corner farthest from you, holding it at a 45° angle. Pressing down hard, pull knife toward you, rolling dough; keep going until dough flips over. Invert dough on your fingertip to make a cap. The harder you press, the thinner the pasta will be. As you shape orecchiette, place them on a lightly floured, parchment-lined baking sheet in a single layer. Cook immediately; dry overnight, uncovered; or freeze. Make ahead: Dough, 2 days, chilled (in fact, it's more supple when made ahead). Shaped pasta, 1 day at room temperature, or 3 months frozen.